There are over 6,000 cenotes in Mexico’s Yucatan Peninsula. A visit to these unique bodies of water is a must, both for their alluring beauty and the insight they offer to Mayan religious beliefs. We chose to journey through four cenotes—each vastly different from the next—with Xenotes Oasis Maya. Our adventures took us kayaking, snorkeling, zip-lining, cliff-jumping, and rappelling. We had such an amazing and knowledgeable day that we decided to share a video so you could experience it, too! Dan does lots of screaming, so it’s worth watching for that alone. Two million years ago (or so) the Yucatan Peninsula was a massive coral reef. Yes—this relatively new addition to the Americas was underwater not all that long ago. But over time water levels descended, the coral reef dried out, and jungles began to form. Meanwhile, the very porous limestone rock started to erode, creating long tunnel networks of underground freshwater rivers and caves. Fast-forward to post-Ice Age. Water levels and humidity increased once more from the icebergs melting; this caused the fragile limestone caves to further erode and collapse, revealing the water underneath. Cenotes were born! The underground freshwater was now connected to the outside world. Today, rainwater and currents continue to dissolve the limestone, constantly changing the landscape of the cenotes. Mayans have long considered cenotes to be sacred entrances to Xibalba (the underworld). Offering sacrifices into the cenotes was a medium to communicate with the gods, specifically the rain gods, of the underworld. But in addition to their spiritual significance, cenotes were also the main source of freshwater for the Mayan people. That’s because the Yucatan has no visible rivers—they are all underground. Communities in the Yucatan continue to use cenotes for freshwater, so it’s important not to wear any chemicals, such as sun block or insect repellent, when diving into the water. The first cenote we visited was the Fire Cenote. An easy zip-line into crystal clear water warmed us up for the rest of the day’s adventures. Next up was the Earth Cenote. It only makes sense that the Earth Cenote would have us rappelling into the earth, going underground into freezing waters. In this cenote you can see the roots from the trees and stunning cave formations. On a clear day, sun shines through the holes from the land above, adding to the ambience. The third cenote of the day was the Wind Cenote. The zip-lines got higher—as did the cliff jumping—testing who really had adventurous souls. Of course, it turned out to be the only two kids on the tour who were brave enough to jump again and again. The final cenote was our favorite. In the Water Cenote, we snorkeled and kayaked, getting the chance to see fossilized shells and more cave formations. The way the light played off the water and rocks was particularly striking. We were extremely impressed with every aspect of the Xenotes Oasis Maya tour. For starters, the guides were fun and knowledgeable. Not only did they keep the energy levels up, they taught us a lot about Mayan culture, the cenotes, and even the surrounding jungle landscape. There was always a smile upon their faces, and it was clear that they were passionate about their jobs—a rare thing in many tours. The group was small, with only about 10 people, which promised a personal experience. This is a great tour for all ages. None of the activities are required—they all come full-circle, with the same starting and end point at each cenote. Some people decided they didn’t want to zip-line, while others opted out of the kayaking. There was never any pressure placed upon anyone in the group to participate if they didn’t want to. However, if it was just a bit of nerves, the guides were fantastic at talking people through their anxiety so they could take part in the adventures of their choosing. And finally, the lunch. Xenotes Oasis Maya advertises it as a ‘glam picnic’, and we would say that’s a pretty fair description. The spread included soup, salad and sandwiches with a large variety of deli meats and cheeses, as well as wine, beer, coffee and water. The alcoholic beverages were a nice touch, though we wouldn’t say the food was all that memorable. Bring a waterproof camera. The photos that the tour takes are very good, but also very pricy. A USB with photos of two people will cost you about $75 for 50 photos. When you add that to the tips and cost of the tour… well, it adds up. Also, know that a large portion of the day is spent in the van driving from cenote to cenote, sometimes along quite poor roads. It’s worth it for the variety of activities and cenotes you get to experience, but something to be aware of. Xenotes Oasis Maya will pick you up and drop you off at your hotel in Cancun. The tour lasts 8-9 hours, with pick-up starting around 9:00am. Regular price for the tour is $119.00, though you can get discounts by purchasing tickets on the Xenotes Oasis Maya website. Have you visited a cenote before? Which cenote from the video was your favorite? We were guests of the Cancun Tourism Board. We were not required to write a positive review of this tour, and all thoughts and opinions are our own. Wow, that looks exciting and you guys are so brave and crazy! It’s difficult to choose but I think my favorite was the last one, water Cenote. Thanks Franca! It was lots of fun :) Great choice with the water cenote- it was so beautiful the way the light reflected on the water! Exciting and wild adventure! Glad you shared it with us. This is exactly my idea of fun, looks great! Thanks Poi! It was an awesome day- definitely recommend it if you are in the area! Thanks Kadri! We are definitely new to videos, but it’s a fun new project! I so want to go! Love this post! I’m soe xcited you guys are doing videos now! That looks SO fun!! We went to see the Gran Cenote near Tulum the other day. 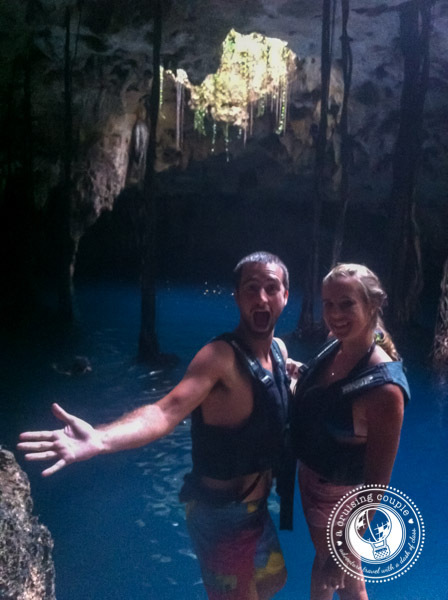 It seems that you explored more than we did because you tried a lot of different Cenotes. Haha thanks! Yea we definitely liked how we got to experience four completely different cenotes. We actually saw a few other ones as well when we were in the Yucatan, but none like these :) How did you like Tulum? I wasn’t a big fan of the Gran Cenote in Tulum because it was quite expensive and not a lot to see. It was so much more fun swimming with turtles at Akumal. And it’s free if you bring your own snorkeling gear :D.
Ack! So jealous you got to do this! I first read about cenotes on Sarah Somewhere’s blog and I have been OBSESSED with seeing one (and jumping into it!) for my very self ever since. I know there are tons of reasons to love the Yucatan, but I think the fact that it has cenotes is at the very top of my list! Definitely a fantastic reason to visit the Yucatan! We didn’t know anything about cenotes before arriving in Mexico. You guys should definitely go diving in one when you get there- I’ve been having trouble with equalization, but we’ve heard it’s amazing with awesome visibility! Those are some huge Cenotes, looks fun as hell! I’ve only been to a few down here in Valladolid and one outside of Merida in the ruins of Dzibilchaltun. Apparently in the latter one some gringos died while diving, as they were sucked down into the underground water caverns. Can’t say whether it’s true or not, but know I won’t be snorkeling/diving in that particular cenote for sure. O wow! I can imagine that some of the cenotes are definitely dangerous. Haha I wouldn’t risk it in that particular cenote either! We were only in Valladolid for about 48 hours, so we didn’t get the chance to see any while we were there, but we would love to visit more if we return to the Yucatan!